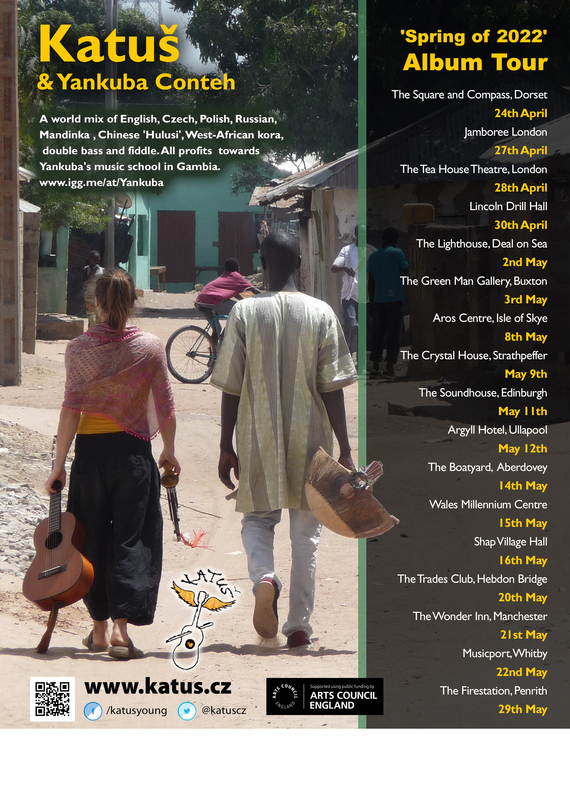 Click here for our indiegogo campaign to fund Gambian Kora player Yankuba Conteh’s UK tour in aid of his MUSIC SCHOOL IN GAMBIA!! See GIG page! Katuš’ new album ‘The Spring of 2022′ is a truly world mix of English, Czech, Polish, Russian, Mandinka, her own improvised tongue, and her Chinese ‘Hulusi’ -gourd clarinet. 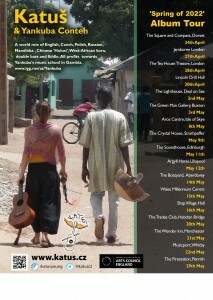 She will be touring around the UK in April/May with the band and Gambian Griot Yankuba Conteh. THEY WILL ALSO BE JOINED BY DOUBLE BASSIST LOUISA JONES FOR SEVERAL DATES.. In 2013, Katuš was booked to sing with Tinariwan at ‘Festival of the Desert’ in Burkino Faso. The festival was cancelled due to the war in Mali, and Katus, stranded in The Gambia, met fellow musician and Griotte, Yankuba Conteh . They spent a month singing together with the Kora, Guitarlele and Hulusi, at naming ceremonies and weddings, in fact whenever a celebration was needed, which is constant amid the timeless West-African chaos. From the dusty streets of The Gambia, where the album was begun, to the sounds of owls in Katuš’ garden. The announcement on her native Prague Metro, which inspired one song , crashing waves and the clip-clop of their horses pulling a wagon, ‘The Spring of 2022 ‘ with all these sounds is a journey through Katuš’ world. Also recorded with musicians Ben Monypenny -Fiddle, Tom Corda- Stanley -Double Bass , Hannah Flynn-Harmonies, and Rob Kitchen -Percussion. Katuš will be touring the country in the Summer of 2015 with a Horse-Drawn Stage and Wagon. She and partner Barny Maurice run Wanderlusts Horse Drawn Holidays, and they will be touring music and “The Horse-Drawn Hotel” from Cumbria to France. They are inviting performers of all disciplines to come and join them as they travel through England and France creating an ever changing Travelling Show, and you can live the life by booking a night or two in “The Horse-Drawn Hotel”. Katuš has toured with Seth Lakeman , supported The Levellers, played with Donovan and Nigel Kennedy, and toured with Czech Indie star Lenka Dusilova and Cechomor to name a few. Katuš recently appeared on channel 4’s ‘George Clarke’s Amazing Spaces’. Katuš has toured all over the world in her 13 year musical career and this is her 5th album.
! 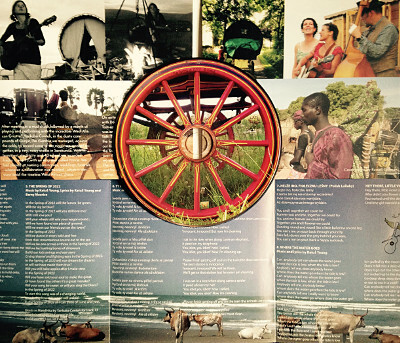 !SPRING TOUR WITH WEST AFRICAN KORA PLAYER AND SINGER YANKUBA CONTEH IS ANNOUNCED!! SEE GIG PAGE!